Sanchez’s critically acclaimed first solo album, Jet Black and Jealous, which was released in 1992. Recorded in New Orleans, Heart Renovations, features 20 new original songs and is available at Louisiana Music Factory, CD Baby, iTunes and Amazon. Paul Sanchez’s award-winning music transforms audiences with his unique blend of music and storytelling – at once powerful, sad, humorous, entertaining, and hopeful. 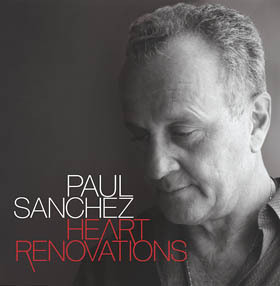 Heart Renovations features the solo acoustic music and soul-searching, poetic lyrics for which Sanchez is best known. The cover art for both albums was designed by Eric William Gernhauser, a graphic designer who worked for New Orleans Magazine for 20 years. Gernhauser returned to CD design for Heart Renovations to recapture the feeling of his original art for Jet Black and Jealous. The art tells its own story – the first, a young musician looking inward, discovering himself as a person and a solo artist. The latter, a man who has lived through more personal and professional setbacks than any one person should have to endure. Sanchez understands and beautifully expresses in both albums that for him the path to growing and healing is musical storytelling. Currently on tour, audiences can expect to hear a mix of Sanchez’s familiar tunes as well as selections from Heart Renovations. For tour schedule, visit www.paulsanchez.com.